He now produces his astounding poetry for individuals as well as his own reactions to world events. Why astounding? Because Laurie is very different. Thirty years working in psychiaty has given him a unique view of life and people and his humble background mean he speaks with the voice of ordinary people everywhere. People who aren't interested in poetry, dismissing it as something for stuck-up people, listen enraptured as he reads his poems in the pub, buying his books with enthusiasm for later reading at home. This with people who have never read poetry in their lives. He strikes a chord and resonates with the thinking of ordinary people. A recent quotation from John Myers on making Laurie Guest Poet at the Poetry Cafe: "Laurie takes poetry to places other poets don't go and can't reach." This sums Laurie up. There is nobody like him. Get his latest book, you will love it. "This book is packed full of emotion. Laurie has an uncanny knack of cutting right into the heart of things and he shines a light on emotions that are hidden deep." Helen Prosper, Health Food exec, Hailsham. "Laurie's words come from the heart and from real life." Sharon Wiltshire, Designer, Willingdon. "Laurie has a unique way of portraying life in his very special way." Yvette Tap, Telephone Sales Consultant, Eastbourne. 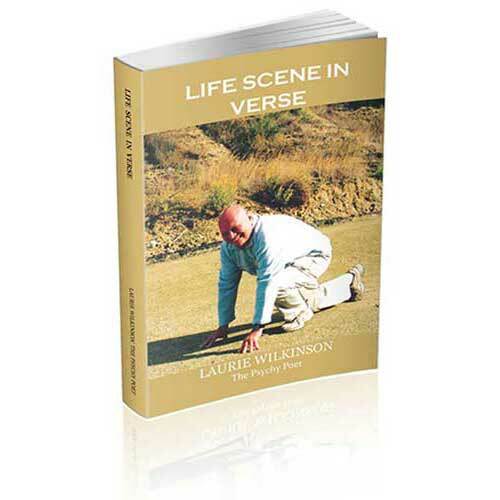 The latest quote comes from the Sussex Newspaper: "We simply loved this book, Life Scene in Verse here at the office. As a poetry lover myself, I highly recommend this book as I'm sure it will delight all who read it."